L'ébénisterie Créole - Traditional Woodworking with Jean Becnel: Cajuns - French, Germans or Something Else? Cajuns - French, Germans or Something Else? I'm often asked - "What does the German Coast have to do with South Louisiana?" The German Coast is, in fact, part of South Louisiana and it's of enormous importance to Louisiana's History. Located along the Mississippi River over the Parishes of St. Charles, St. John the Baptist and possibly a bit of St. James the German Coast is the earliest successful European Agricultural Settlement in Louisiana. 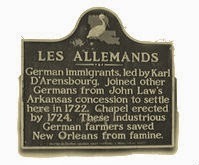 Though brought over by the Parisian French West Indies Co, German's arrived in mass to settle here 30 years before the Acadians, or Cajuns as they are often called. So why is Louisiana known for the Cajun French instead of the Cajun Germans? Though the German settlers, brought here by the European French predate the French Acadians there were far less of them. The Germans were mainly only German in Culture as they hailed from areas such as the Alsace Lorraine Region ruled by France. It's an unfortunate oversight by us for not teaching this history. The reason I focus so heavily on the German Coast in regards to subjects of Timber Framing or Early Agriculture is because they were the first to really tackle the task is South Louisiana - at least to the scale at which they did. I try to start stories on the first chapter and while this is by no means Chapter One for those cultures or for the America's it is just that for South Louisiana. There is a lot of information out there on Early Louisiana and I by no means consider myself an authority on cultural history. I have intentionally withheld from delving too deeply into the history or time lines of the Louisiana people as there are dozens of books on the subject by credible and respected authors - yet they all differ in story from one to the next. I encourage you to do further reading on the topic on your own and form your own impression based upon the information out there. Also for additional information on the early days of settling on both the German and Acadian Coasts, please visit these fine sites below.